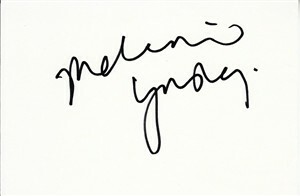 4x6 index card autographed in black marker by actress Melanie Lynskey, best known for playing Rose on Two and a Half Men. Obtained in person, with certificate of authenticity from AutographsForSale.com. ONLY ONE AVAILABLE FOR SALE.